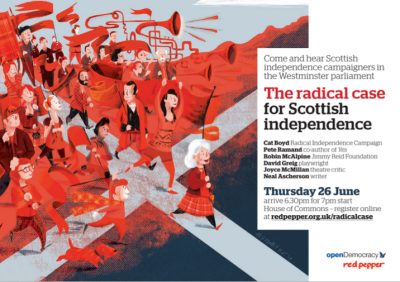 As part of our English for Yes series here’s details of an important event organised by Red Pepper and openDemocracy ‘The Radical Case for Scottish Independence’ Committee Room 14 House Of Commons. Book your tickets here. Nicky Clarke’s comments were probably helpful. Having a celebrity hairdresser from London telling the people from the country which invented economics that they don’t understand it is always gonna be a good way to drive Scots towards a yes vote. But his comments – that we need to move the debate away from “the romanticised, almost Braveheart sort of things” are telling, particularly given that Jo Cockburn, who was interviewing him on the Daily Politics, responded by saying “which has certainly all that’s been talked about up until now”. That a celebrity hair stylist is ignorant of the conversation happening in Scotland shouldn’t come as a surprise. But the idea that a serious political journalist can merrily decree from London that the debate in Scotland, which has largely focused on the ills of Anglo-American turbo-charged neo-liberalism, has instead been about a mythologised figure from the 14th century, is worrying. And it’s a real problem. It’s a problem because much of the media in Scotland comes from London. And as that media enters over the summer what is usually the silly season, with Parliament in recess, it will have little to talk about but the Scottish referendum. And so the story that Scots will be told about ourselves is likely to end up getting more and more ridiculous – unless we do something about this. If the yes campaign is to be won, it will therefore need to ensure that at least the more sensible English journalists properly reflect the debate. They don’t need to be persuaded of the merits of independence, but they do need to be capable of mediating the conversation without repeating sillinesses about what’s being discussed. Because the more these things are repeated in tellies in Scotland, the more that Scots are told these things by their friends in England, the more they will become self fulfilling prophecies. It’s not just about the media. In the closing weeks of the Quebec referendum, activists from across Canada converged on the province, and asked people to vote to stay – not because it was necessarily what was best for Quebec, but because the rest of Canada wanted them. The message, by all accounts, was at least to some extent convincing and, in the Scottish context, is all the more powerful because of the (a-historical) belief that a yes vote would impose perpetual Tories on England. People aren’t selfish. They will consider the interests of their neighbours, and for the undecided, the feeling that they are abandoning their cousins to the South will hold some sway. To counteract this message, it’s going to be important to convince people in England – activists in England – that the opposite is the case – that they should support independence because it’s good for the Scots, and because it’s good for the English. Which is relatively easy – it is. England is more damaged by the anachronistic British institutions to which independence would be a serious blow than is Scotland. At least Scotland has Holyrood to cushion the attacks. Building a bank of progressive voices south of the border to encourage Scottish independence won’t win the referendum. But failing to do so could be a big mistake. If you’re in Scotland – as I assume the majority of Bella readers are – please do encourage any friends in or near London to go. If they already support independence, it’ll hopefully help them make the case and encourage them to do so more vociferously. If they are unsure, maybe they’ll be convinced. If they are currently against independence, perhaps our panel can sway them. If you are in London or the South East, I’ll look forward to seeing you there. Saying that Scots invented economics is as ridiculous as saying the English invented evolution. Having said that, I agree with most of the rest of your article. I don’t know any politically literate person down here that isn’t hoping for a yes vote. As a Glaswegian living in London I’d like to offer a heartfelt thanks to Cat, Robin et al for making the trip south and making this happen. Really looking forward to going along and feeling a little closer, if only for an evening, to the debate. Maybe that’s what Nicky Clarke et al are counting on too! Interesting piece, hope you get good numbers tomorrow. Adam, good luck with the event. The idea of holding The Radical Case for Scottish Independence in the house of commons is delicious. It is my experience that most people in England don’t think of Scotland at all. They don’t need to, unless it is to their benefit. When they do start to think about Scotland what they “think” Scotland is, is as far away from reality as, say “the English inventing evolution”. You can see the confusion in the pages of the otherwise progressive Guardian newspaper. We can kid ourselves that they “care” or are “sympathetic” but in fact the majority do not connect with us politically, which is a tragedy. This is, let’s be clear, not the fault of the Scots but is the usual behaviour of a huge nation obsessed with itself, as most huge nations are. Our main political problems are within Scotland and until we deal with them its pointless to expect the English press or political class to “understand us” or give a damn. They display the same superficiality for other countries and cultures and pass that of quite the thing as informed opinion on prime time TV. Good luck in Westminster. I’d be interested to know who turns up. Would have loved to attend this meeting, but unfortunately I have an important, pre-booked appointment with my GP. Guess I’ll just have to settle for the Evening Standard sponsored debate on Monday 30th instead. If anyone in London doesn’t know about this one, details can be found on Evening Standard website, http://www.standard.co.uk/ It’s free entry, but only if you pre-book tickets. If there are to be any more events in London, it would be great if they were announced enough in advance, so that people can fit them in with any other commitments they may have. Thanks. Hope it’s a great success. Here in the southern hemisphere I depend more than ever on Bella to bring me some good news. It’s a nightmare in Australia with the right wing discourse 24hrs a day. Cannot wait to be in Scotland for the referendum even without a vote. I went, last night, to this meeting. Amazing. There is a ghost now haunting the British Establishment, and it is the ghost of the dangers of a good example. If YES, then Scotland, pursuing its social democratic course, would represent a daily and humiliating rebuke to the Elites of the remaining, collapsing UK, as it sunk ever deeper into poverty, austerity, racism and a surveillance state. Not to mention the issue of the OIL, the massive economic damage to the economy of England that would result from the abrupt departure of those billions of oil revenues, and the generally and ever increasing nastiness of the London Government. In the circumstances, But: Even in the event of a NO vote, it is worth quoting what Neal Ascherson said last night, at that meeting, in the depths of the English Parliament. He said: “(Whatever) Happens, the Union is finished. it is over.it is gone for ever, as Scotland has changed radically, and it’s people have realised another kind of Scotland is possible”. This brought loud applause. Sorry if I appear pedantic, but Westminster is the British, not English, Parliament. If it were an English institution, it would have no MPs from beyond England’s borders, and it might work on behalf of England once in a while. Glad to hear it went well. I agree with Neal Ascherson. Last time I spoke with him was in Wick.